I love Stardust. I loved it upon its original release on Amiga 500. I remember being astonished at the tunnel sequence and stunning intro that was like nothing else at the time. I loved it when it was re-released as Super Stardust on the CD32, and I loved it even more on its massive, HD updating for PS3 and its subsequent PS Vita release. 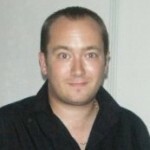 It is a shame then, that it is unlikely to ever find a release on iPhone. 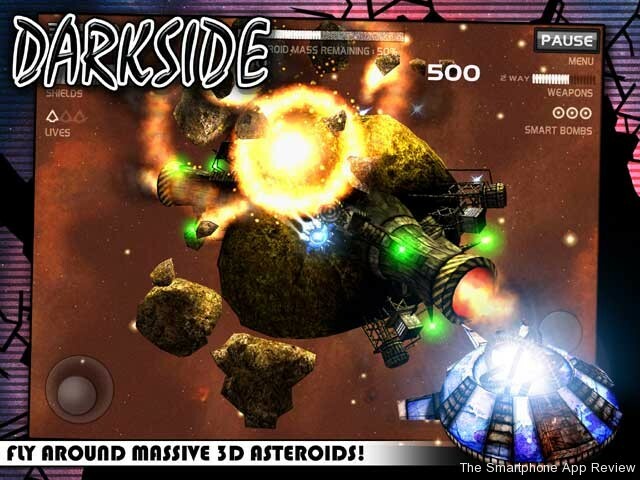 All is not lost, however, as Darkside is here to save the day and bring that classic Stardust feel to iOS. 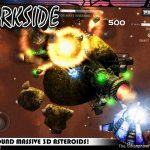 It is important to take note of the fact that I used the word ‘classic’ to describe Darkside, as it plays a lot, lot more like the original Amiga game in the way it feels, despite the fact that it takes the spherical levels of the PSN game and the twin stick controls of that release. This feels like the Amiga game. 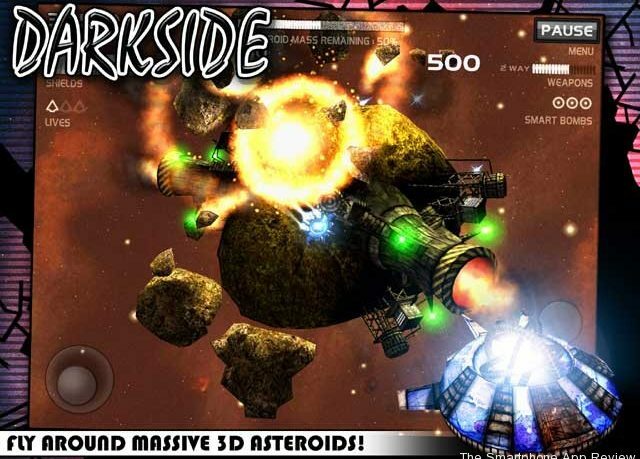 Darkside, like Stardust, has its roots set firmly in the mold of Asteroids. You fly around various planetoids and must destroy large asteroids, which then creates several, slightly smaller asteroids, and so on. If you don’t think about where you are shooting, you can end up with a screen absolutely full of rocks. Rocks are not your only problems, as there are many enemy ships out to destroy you as well, and many of them will hunt you down in seconds if you don’t take evasive action. It is the same hunter/hunted based action that can turn in an instant that made Stardust so good. However, Darkside does differentiate itself from Stardust in one big way: installations. Many of the planets have entire, city like installations that must be protected. Enemy craft will home in and try to destroy these, and it can be a real challenge trying to protect them, especially when they can be located on separate sides of the planets. Add hundreds of asteroids to the mix and you have got yourself a challenge. There are also rock formations to try and avoid, but which can actually provide a nice bit of cover if you are clever. The game is controlled by two virtual sticks, in either fixed positions, or the preferred floating option. The developer has even included a left hand mode. 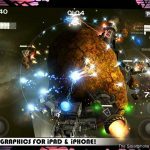 You can collect many different power-ups, which can all be combined together, creating a dazzling show with bullets flying out from your ship in all directions. It is here that I do have a small issue, as it can be very easy to lose which way you are supposed to be facing, as all the bullets that fly out are blue. There are some lights at the front of your craft, but they get lost amid the fireworks too easily. If the front facing fire was a different colour, or there was a line of sight beam at the front, that would help a lot here. It wasn’t such an issue on the big screened PC version of the game, but I do think it is needed here. 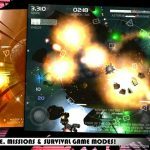 The game is free, and comes with the basic arcade mode included, with a mission mode and a survival mode available with a small IAP. I know I usually harp on about IAP’s, but here you simply must upgrade, as the mission mode is brilliant, and worth it all on its own. The IAP also gets you some handy smart bombs. 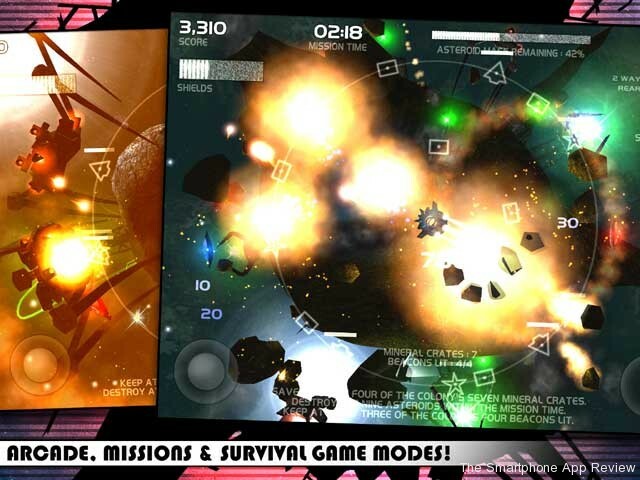 The mission mode sees you taking on different planetoids with varying mission objectives far each stage. It is great fun, and gives the game some real meat that you will come back to long after the arcade mode has lost its allure. More games should do this. The graphics are great, and the developer has done a sterling job of porting the game over from the PC, with seemingly hundreds of rocks flying around, not to mention all the bullets. 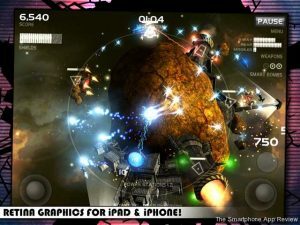 The game runs really well on an iPhone and iPhone 4S, but you will experience a bit of slowdown on a 3GS. There are Game Center leaderboards, with achievements, included, to give the game some extra legs. Not that it needs them with the mighty mission mode that has 100 stages. Overall, this is a fab little game that will keep you entertained into the small hours with its superb range of modes to play through. The pumping soundtrack and decent graphics keep the experience modern, while the gameplay harks back to the Stardust of old. A brilliant shoot em up that is surprisingly tactical and full of depth. Check out our reviews of Dead Trigger, Mega Run and Astrowings 3!